Aka Buddhist Pine or Chinese Yew. 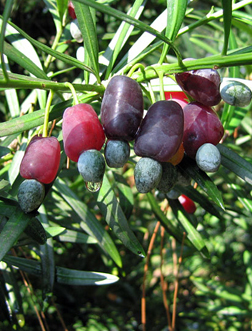 The Podocarpus is a dense evergreen with pointed, leathery, dark green leaves arranged on stiff, symmetrical branches. The tree which is unisexual, has male flowers in cones and female flowers composed of cylindrical thickened scales. The fruits are edible, pendiculate, fleshy and brightly colored. New floiage appears light green in color that turns darker with age. 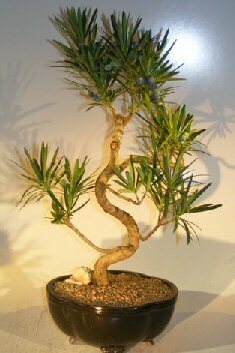 Our tree is trained in the traditional bonsai style with a curved trunk and tiered branches. Grows very well albeit slowly indoors. Indoor flowering bonsai tree, grown and trained by Bonsai Boy.